"Blessed milk thistle" redirects here. For "blessed thistle", see Cnicus. "Milk thistle" redirects here. For other uses, see List of plants known as milk thistle. Silybum marianum has other common names including cardus marianus, milk thistle, blessed milkthistle, Marian thistle, Mary thistle, Saint Mary's thistle, Mediterranean milk thistle, variegated thistle and Scotch thistle (though not to be confused with Onopordum acanthium). This species is an annual or biennial plant of the Asteraceae family. This fairly typical thistle has red to purple flowers and shiny pale green leaves with white veins. Originally a native of Southern Europe through to Asia, it is now found throughout the world. Milk thistles can grow to be 30 to 200 cm (12 to 79 in) tall, and have an overall conical shape. The approximate maximum base diameter is 160 cm (63 in). The stem is grooved and more or less cottony. The largest specimens have hollow stems. The leaves are oblong to lanceolate. They are either lobate or pinnate, with spiny edges. They are hairless, shiny green, with milk-white veins. The flower heads are 4 to 12 cm long and wide, of red-purple colour. They flower from June to August in the North or December to February in the Southern Hemisphere (summer through autumn). The bracts are hairless, with triangular, spine-edged appendages, tipped with a stout yellow spine. The achenes are black, with a simple long white pappus, surrounded by a yellow basal ring. Possibly native near the coast of southeast England, it has been widely introduced outside its natural range, for example into North America, Iran, Australia and New Zealand where it is considered an invasive weed. Cultivated fields for the production of raw material for the pharmaceutical industry exist on a larger scale in Austria (Waldviertel region), Germany, Hungary, Poland, China and Argentina. In Europe it is sown yearly in March–April. The harvest in two steps (cutting and threshing) takes place in August, about 2–3 weeks after the flowering. Exkursionsflora Fuer Kreta by Jahn & Schoenfelder (1995, page 326) states that the distribution is mediterranean-near east. They quote it as a native plant of Crete, Greece. Milk thistle has been used for a number of purposes including treatment of liver disease, prevention and treatment of cancer, and supportive treatment of poisoning from death cap mushrooms; however, clinical study results were described as heterogeneous and contradictory. A 2007 Cochrane Review included eighteen randomized clinical trials which assessed milk thistle in 1088 patients with alcoholic and/or hepatitis B or C virus liver diseases. It questioned the beneficial effects and highlighted the lack of high-quality evidence. The review concluded that more good-quality, randomized clinical trials are needed. Cancer Research UK say that milk thistle is promoted on the internet for its claimed ability to slow certain kinds of cancer, but that there is no good evidence in support of these claims. Milk thistle may appear to stimulate prolactin due to possibly estrogenic activity. Milk thistle based supplements have been measured to have the highest mycotoxin concentrations of up to 37 mg/kg when compared to various plant-based dietary supplements. Milk thistle has also been known to be used as food. The roots can be eaten raw or boiled and buttered or par-boiled and roasted. The young shoots in spring can be cut down to the root and boiled and buttered. The spiny bracts on the flower head were eaten in the past like globe artichoke, and the stems (after peeling) can be soaked overnight to remove bitterness and then stewed. The leaves can be trimmed of prickles and boiled as a spinach substitute or they can also be added raw to salads. ^ "Silphium marianum". Natural Resources Conservation Service PLANTS Database. USDA. Retrieved 15 November 2015. ^ Rose, Francis (1981). The Wild Flower Key. Frederick Warne. pp. 388–9. ISBN 978-0-7232-2419-8. ^ Darwin, Charles Robert. The Voyage of the Beagle. Vol. XXIX. The Harvard Classics. New York: P.F. Collier & Son, 1909–14; Bartleby.com, 2001. www.bartleby.com/29/ [accessed 30 Sep 2016] Ch VI. "Charles Darwin, who visited the pampas while traveling around the world, refers to Cynara cardunculus as cardoon, differentiating it from the great thistle, which scientific designation does not mention, described by F. B. Head. The former was as high as a horse; the second, higher than the head of a horserider. In Far Away and Long Ago, William Henry Hudson mentions two types: the cardoon thistle, or wild artichoke, of a bluish or grey-greenish color, and the giant thistle, cardo asnal for the natives and Carduus marianum for botanists, with white and green leaves." ^ Greenlee, H.; Abascal, K.; Yarnell, E.; Ladas, E. (2007). "Clinical Applications of Silybum marianum in Oncology". Integrative Cancer Therapies. 6 (2): 158–65. doi:10.1177/1534735407301727. PMID 17548794. ^ a b c Kroll, D. J.; Shaw, H. S.; Oberlies, N. H. (2007). "Milk Thistle Nomenclature: Why It Matters in Cancer Research and Pharmacokinetic Studies". Integrative Cancer Therapies. 6 (2): 110–9. doi:10.1177/1534735407301825. PMID 17548790. ^ Hogan, Fawn S.; Krishnegowda, Naveen K.; Mikhailova, Margarita; Kahlenberg, Morton S. (2007). "Flavonoid, Silibinin, Inhibits Proliferation and Promotes Cell-Cycle Arrest of Human Colon Cancer". Journal of Surgical Research. 143 (1): 58–65. doi:10.1016/j.jss.2007.03.080. PMID 17950073. ^ Rainone, Francine (2005). "Milk Thistle". American Family Physician. 72 (7): 1285–8. PMID 16225032. ^ Rambaldi A, Jacobs BP, Gluud C (2007). "Milk thistle for alcoholic and/or hepatitis B or C virus liver diseases". The Cochrane Database of Systematic Reviews (4): CD003620. doi:10.1002/14651858.CD003620.pub3. PMID 17943794. ^ Foong, Siew Cheng; Tan, May Loong; Marasco, Lisa A; Ho, Jacqueline J; Foong, Wai Cheng (2015-04-10). "Cochrane Database of Systematic Reviews". Cochrane Database of Systematic Reviews. doi:10.1002/14651858.cd011505. ^ Veprikova Z, Zachariasova M, Dzuman Z, Zachariasova A, Fenclova M, Slavikova P, Vaclavikova M, Mastovska K, Hengst D, Hajslova J (2015). "Mycotoxins in Plant-Based Dietary Supplements: Hidden Health Risk for Consumers". Journal of Agricultural and Food Chemistry. 63 (29): 6633–43. doi:10.1021/acs.jafc.5b02105. PMID 26168136. The highest mycotoxin concentrations were found in milk thistle-based supplements (up to 37 mg/kg in the sum). 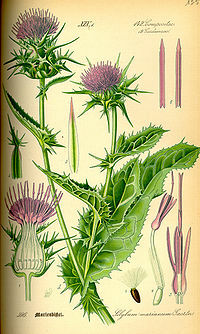 Wikimedia Commons has media related to Silybum marianum. "Silybum marianum". Plants for a Future.